For our exercise of the week this week, consider moving your body in new ways with cardio kickboxing. This is a great way to incorporate some new and important functional movements into your routine, while also toning muscles that you may not otherwise target with your current fitness routine. Cardio kickboxing is also a great combination exercise that works on balance movements, strength movements and increases your heartrate to burn calories. While kickboxing is known as a fighting style, by adding a dedicated cardio element to it; it becomes a powerful discipline to work into your fitness routine. By learning stances, punches, knees and kicks, your body will gain strength, flexibility, balance and stamina in abundance. While you can ask any of our fitness team to demonstrate and guide you through some basic cardio kickboxing moves in the gym space, you can also attend the cardio kickboxing class at Westpark Fitness (free for members) if you want to learn it in a more structured manner. 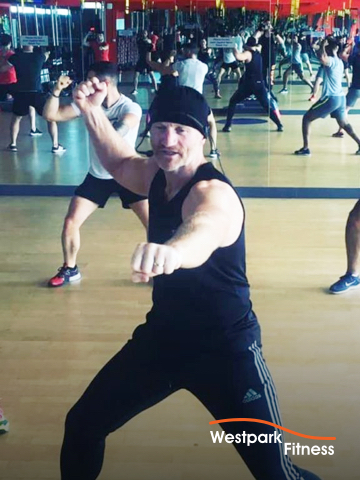 Led by world kickboxing champion and martial arts master Liam Dale, each class lasts for forty-five minutes and will help you burn calories, tone up and help in your weight loss efforts. Learn more about the cardio kickboxing class (including class times) here. As a premier health and fitness facility and gym in Tallaght, Westpark Fitness offers our members a world class way in which to reach their health and fitness goals. Make sure to approach any of our friendly and helpful fitness team if you ever need any help or assistance with any type of exercise. Make sure too to try out our huge range of fitness classes which are free for all of our members. Not a member of Wespark Fitness yet? Click / Tap here to book a FREE tour!